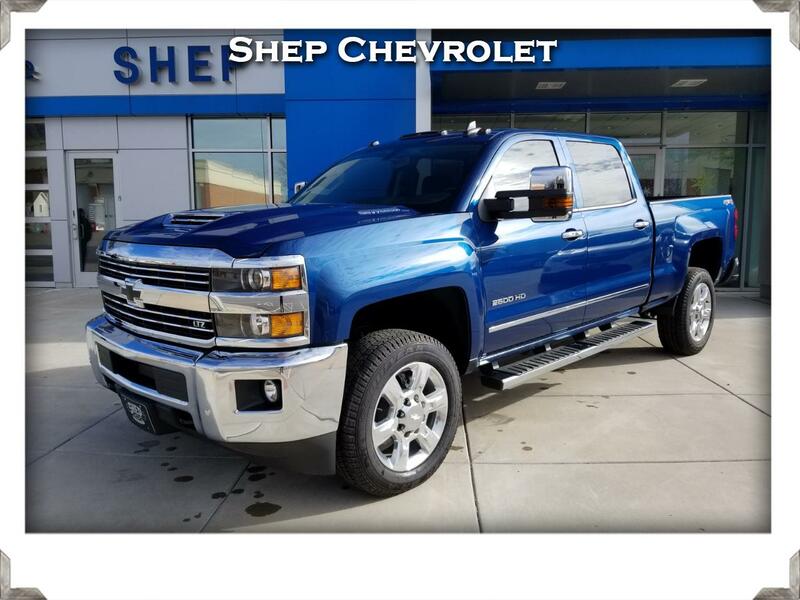 Shep Chevrolet is excited to offer this new 2018 Chevrolet 2500 HD Silverado Crew Cab Z71 LTZ 4X4 with a powerful 6.6 liter diesel engine. This 2500 Chevy Silverado is loaded with tech, amenities like heated and cooled seats and it features the Duramax Plus Package, which comes with in-dash NAV, a Bose sound system and a htd steering wheel. To experience it for yourself, schedule to test drive this beautiful Silverado today. Do you have questions about pricing, options, incentives or availability of similar models? Give us a call at 800-468-3650 and we'll help answer all of your questions. Call or email today to check vehicle availability, current GM incentives or to set up a test drive. Warranty Description: BUMPER TO BUMPER: 3 YEARS / 36,000 MILES For 3 years or 36,000 miles, whichever comes first. Any vehicle defect repairs are covered. DIESEL POWERTRAIN: 5 YEARS / 100,000 MILES The powertrain, which consists of your engine, drive systems, transmission/trans-axle, transfer case and emission control systems is covered for 5 years or 100,000 miles, whichever comes first. ROADSIDE ASSISTANCE: 5 YEARS / 60,000 MILES MAINTENANCE BENEFITS: For New 2019 Vehicles: 1 YEAR - 1 VISIT During your first 12 months of ownership of your 2019 vehicle, one oil change and tire rotation is included. *MSRP less cash offers. Tax, title, license and dealer fees extra. Residency restrictions apply. Not available with some other offers. See dealer for details. 1 Excludes L model. Not available with special financing, lease and some other offers. See participating dealer for details. Must take retail delivery by 04/30/2019 2 Excludes L model. Some customers may not qualify. Not available with special financing, lease and some other offers. See dealer for details. Must take retail delivery by 04/30/2019 *Lowest pricing of vehicles on this web site may not include options that have been installed at the Dealership. Pricing may include current promotions, incentives, and/or bonus cash. Incentives are subject to eligibility and compatibility guidelines provided by the manufacturer. All rebates to dealer. Published price subject to change without notice to correct errors or omissions or in the event of inventory fluctuations. Monthly payment calculator is an estimate and does not include tax, title, license or doc fees. Please contact the Dealership for latest pricing and monthly payment. Please contact store by email or phone for details. While every effort has been made to ensure display of accurate data, the vehicle listings within this web site may not reflect all accurate vehicle items. Accessories and color may vary. All Inventory listed is subject to prior sale. The vehicle photo displayed may be an example only. Vehicle Photos may not match exact vehicle. Please confirm vehicle price with Dealership. See Dealership for details. Message: Thought you might be interested in this 2019 Chevrolet Silverado 2500HD.